Detail of Lundberg Black Japonica and Mahogany rice. See? 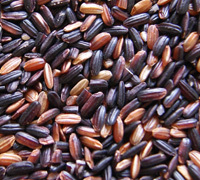 Dark rice, short and medium grains. That’s the stuff.I dashed into an eatery a little while ago and picked up a dish of curried rice salad when I was pressed for time. It was a perfectly serviceable lunch, and really the only problem with it was that it cost an egregious amount of money for what it was. Okay, that and the fact that it had enough turmeric in it that the white rice glowed yellow, but the curry flavor was nonexistent. It was the kind of dish that, when you taste it, you know you can do better than that. So I did. I call this easy. It takes a long time to prepare, but none of the steps are hard ones. I’ve made it three times since that rainy day, in varying proportions, which is what you have to do when you’re cooking without a recipe with a goal in mind, and I know I’ll tweak it and probably never make it the same way again. It’s a good jumping-off point, though. Scoop out a cupful for a quick lunch and think about the way you’ll adjust it for next time. Or do what I do and eat it for breakfast. 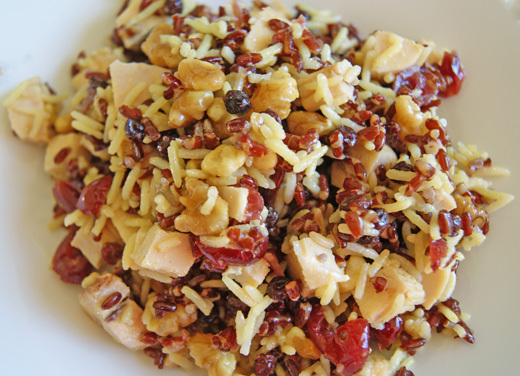 Anything with cranberries and walnuts is good for breakfast. It IS. Place the cranberries and currants into a heatproof glass bowl. Pour boiling water over them until they’re well submerged. Place the fruit in the refrigerator to rehydrate. Prepare the rices separately according to directions, including salt. Rinse the basmati well, and after cooking, rinse it with boiling water and allow it to steam. Prepare the dark rice until it’s just done, not overdone. Combine both prepared rices in a large bowl. Prepare a curry oil: Heat the flavorless oil gently on the stovetop. Add the curry powder (and cayenne if using) and mix well. Allow the curry powder to flavor the oil for a few minutes, and then pour some of it over the combined rices. (You want just enough oil to keep the rice grains lubricated but not enough to make the salad oily; you should have some left over.) Mix well. Add the chopped chicken or chickpeas. Mix well. Taste for salt. Spread the rice mixture in a baking dish or other shallow container to aid cooling, if desired. Chill. Drain the fruit well and add it to the rice mixture. Toss. Toast the walnuts in a skillet for a few minutes until fragrant; add to salad and toss one more time. Taste and salt as desired. If you have the time, the rice is even more separate if you make it a day in advance and chill it before you make the curry oil. This is probably a little impractical for most people, though, so let’s just call it a modification. Feel free to throw in more turmeric to turn the rice very yellow. (I did, with one batch. I like happy yellow food.) You can also adjust the seasoning of the oil as desired. My favorite batch had more cumin and coriander than the others. A little lemon juice at the end will bring out the flavor of the fruit. Just squeeze a few drops on each serving at the table. If you choose chickpeas over chicken, you will probably need a little more curry powder in your oil. I think this would be awesome with chopped bits of snow peas. You do too, right? Copyright © 2010-2015 Kim Samsin. Contact the site owner for permission to reproduce content. This site lives on Squarespace 7.